Summary by Nicola Whitley, New Hampshire Fish and Game Dept. 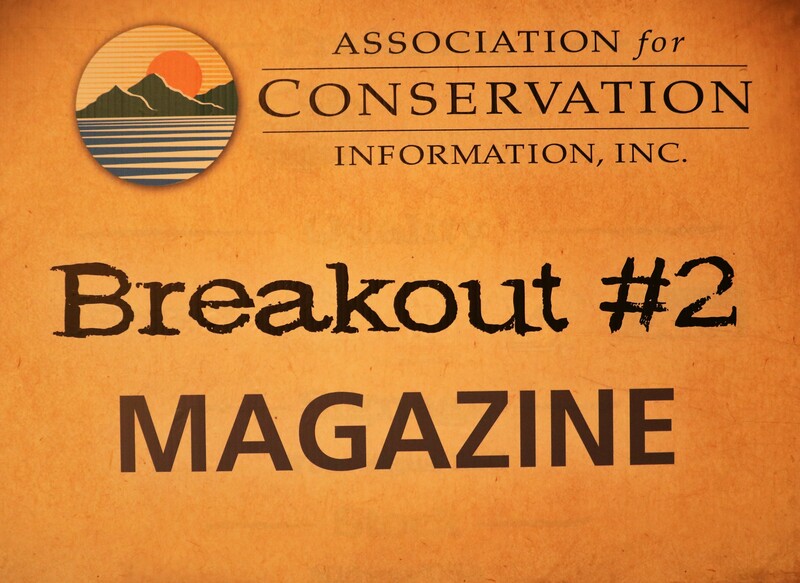 Not only was I lucky enough to be able to attend my first ACI conference and see the beautiful state of Missouri for the first time, but I also chose the Magazine breakout double session, and it was an excellent choice. Facilitators Angie Morfeld and Stephanie Thurber from the Missouri Dept. of Conservation (DOC) dove right in and spurred an extremely helpful conversation among the magazine enthusiasts who attended. The title of the session was “Magazines: Connecting Through Change,” and that theme carried throughout the two meetings as all of us were struggling to keep subscription numbers up in this digital age as well as to keep pace with technology. Some of the hot topics were whether to have an online version, selling advertising or not, promotion ideas, funding, finding good writers, in-house versus contract work and surveying readership. We even spent a fair bit of time discussing social media platforms and how their use dovetailed with our content and promotion. States were literally all over the map when it came to what they were doing. Nevada came because they were thinking of starting a magazine! Some agencies are looking to do a redesign and some recently did. Some states are all digital, such as the DOC in Missouri, some are only print, such as us in New Hampshire (though an online option is one of the things I wanted to explore), and others are a combination. One thing we agreed on though is that to gain and keep younger readers, we need to reconsider our designs by including more visuals, using less text, using updated typography, and making the content relevant to them. The goal, of course, is to do this without losing or alienating our core, older readers. There was much discussion about content and what works. From recipes to places to visit to a plants section to kids’ content to traditional “hook and bullet” stories. Some states had tried contests and all-photography issues. Texas even took their staff on the road and did an entire issue about their trip. The creative ideas were extremely helpful and I cannot wait to share them with our staff. Everyone was very willing to help, offer ideas and suggestions, and share lessons learned. One thing for sure is that we are all very passionate about our publications and what we offer our readers. We all felt the sessions were very worthwhile, so much so that we decided to create an email group and stay in touch after the conference. So, thank you ACI for this learning opportunity. I will be keeping in touch with my Magazine Tribe throughout the year. If you couldn’t attend the conference but would like to join the “Magazine Tribe” email group, please contact me at Nicola.whitley@wildlife.nh.gov.